XINCA cat6 Flat Ethernet Cable brings you an excellent experience of surfing the Internet. The lan cable transmits at the frequency of 250 MHz, which accords with the Rohs Standard. Our product uses 100% pure copper as its conductor, which has high-quality performance and applies to 1.0 Gbps as well as 10 Gbps. Transmitting your data at the fastest speed of 10 Gbps, it also brings an excellent network and stable speed despite the long distance. The cable applies to Home and Office Networks. With a thickness up to 0.06 in an ultra flat Ethernet cable, it protects your cable from being abraded and curved. With the presented cable clips, it will not only improves the outlook of your home or office but protects the wall. 1.XINCA cat6 ethernet cable belongs to the cable type, so please keep it from the baby and child, avoiding to wind their necks, which might lead to strangle. 2.The package is the plastic product, so please keep it far from baby and child, so as to prevent something terrible happens. ★SUPERIOR ATTRIBUTE: Cat6 ethernet cable 50 ft meets the 32 AWG Standard and is granted with the UL Authentication, 250 MHz,which supports 10BASE-T/100BASE-TX/1000BASE-T / 1000BASE-TX, as well as provide you with excellent experience of surfing the Internet. ★HIGH QUALITY: Cat6 ethernet cable 50 ft is made from 100% pure copper, which can get you rid of noise and inteference, and confroms with the RoHS Standard. In addition, this product uses PVC environmental cover that protects the copper core, improves the product's durability and stability. ★UNIQUE FLATNESS: Flat ethernet cable 50ft can better be laid under the carpet,corner and other surfaces. 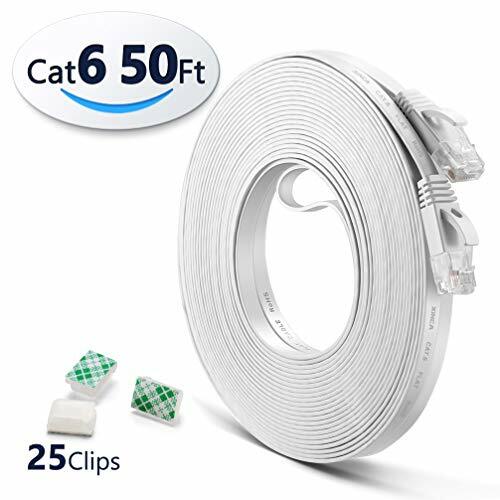 Combining Cat6 flat ethernet cable 50ft with the presented cable clip , can better stick wire to wall,meanwhile protect wall from being damaged. ★UNIVERSAL COMPATIBILITY: Cat6 flat internet cable 50ft is applicable to communication device with RJ45 socket,such as home server,Xbox,PS4,router,data room，HDTV,RoKu,and switch. ★WARRANTY: 90 Days Warranty. We have confidence in our products,so don't hesitate to e-mail us for 24x7days customer service. Thank you! If you have any questions about this product by XINCA, contact us by completing and submitting the form below. If you are looking for a specif part number, please include it with your message.